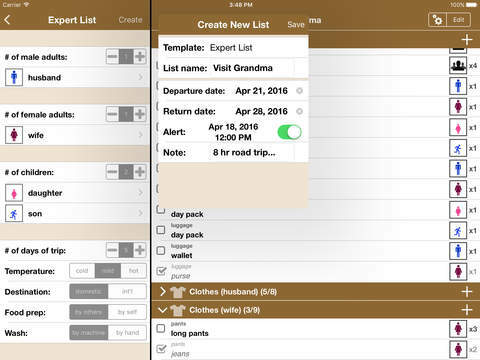 Packing Pro is a super-enhanced version of the popular, top-ranking Packing app. If you desire great syncing & sharing options, display customization, a huge catalog, lots of sample lists, & additional, built-in Expert assistance, then Packing Pro is for you! If you have any problems with installation or in-app purchase, found bugs, questions, comments about this application, you can visit the official website of Quinn Genzel at http://www.quinnscape.com. - List dates (FIX): Now you can set any Departure Date (future or past) that you wish, though the app will still auto-correct the Return Date to be that same date, at the earliest. Alert dates will continue to auto-correct for NOW (+1 hour), at the earliest. - Bug (FIX): Backpack-stroller icon flip-flop (how did that happen?!). You may need to double-check and re-edit this, if one of these were used. Also, for iCloud auto-sync users on iOS 8, in case you haven’t done so yet, please upgrade ALL of your devices to iCloud Drive. Thanks, too, for all your feedback & support, and stay tuned for more updates! Also, for iCloud auto-sync users on iOS 8, in case you haven’t done so yet, please upgrade your device to iCloud Drive. - COMPLETE DESIGN REVAMP FOR iOS 7 -- now cleaner & lighter! Check out 'New Suitcase' theme! MAJOR UPDATE: TRUE MULTI-PERSON & MULTI-BAG LIST SUPPORT -- GREAT FOR FAMILY TRIPS! Ghost Buddy 3D - SALE!